The coral reef that day was filled with plankton. Butterfly fishes drifted through, occasionally stopping to nibble on bits of coral. They were like a school of miniature art models with their protruding mouths and vivid colours. The warm current quickened their movements, and they swam through the reef, disturbing millions of swarming plankton. Just above their shoal, a half hundred silversides wandered in a different direction pursuing copepods. All of a sudden, the silversides saw before them the diffuse glare of an enormous school of jacks. This was the largest shoal of jacks that the silversides had ever seen before. They were surrounded on all sides and there was no escape. So they swam deeper and deeper, hoping that they would be able to hide among the crevices of coral reefs. Usually, the shoal of jacks would have split up into smaller shoals. The smaller fish would have separated from the bigger ones. But that day even the heaviest jacks — six or eight years old — stayed together and moved so fast that the silversides couldn’t swim away. The butterfly fish watched the movements of these darting, wheeling jacks, opening their large mouths gulping silversides, with excitement. They were so engrossed in this show that none of them thought of what would happen once the jacks had gobbled up all the silversides. In a few minutes, the silversides at the corners of the shoal had been eaten and those in the middle were about to be. Soon, the hungry, ambitious jacks had gulped down the last of them and were beginning to look around for their next meal. Now the butterfly fishes became alert. A few dodged, others hid in the crevices of corals, and a few unlucky ones froze in fear. But it was too late. 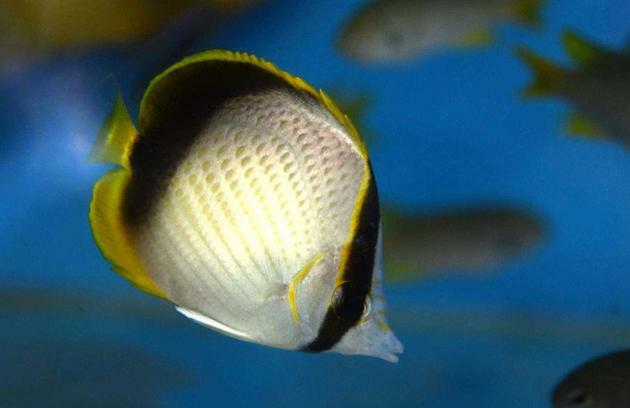 Neither their fast movements nor their rapid flashing of fins could manage to warn the other butterfly fishes. As a result, a few butterfly fish lost their lives. And all the other fish — the snappers, puffer fishes, squirrel fishes, surgeon fishes, clown fishes, frog fish, scorpion fish, emperor fishes, whom the jacks did not seek, fled from their dark shadow. All action stopped and a silence pervaded. All the smaller fish stayed completely still, until the shoal of jacks passed from the patch of reef. Slowly the butterfly fishes placed their protruding mouths out on the reefs, confirmed the jacks were at a distance, and emerged to continue nibbling on the polyps of corals, as if nothing had happened. Their fellow fishes had just been eaten, but there was neither grief nor despair. The fishes that had just survived knew that once again the shoal of silversides would be torn by the endless pursuit of these jacks. Slowly, the reef filled with the hustle and bustle of fish once again. Eternally occupied with the quest for food, the butterfly fishes browsed peacefully on the reef until the great jaws of big fish were too close. This article appeared in the Hindu in School on 10 July 2013.